We are excited to announce that ICOPA X1, the eleventh International Conference on Penal Abolition will happen in Tasmania, Australia from February 9 - 11,2006. Please pass this onto all networks. Previous conferences have happened in 1983 Toronto Canada, 1985 Amsterdam Netherlands, 1987 Montreal Canada, 1989 Poland, 1991 Indiana USA, 1993 Costa Rica, 1995 Spain, 1997 Auckland NZ, 2000 Toronto Canada, and 2002 Lagos, Nigeria. Justice Action has accepted the responsibility to coordinate this conference, and will be working with others around the world to ensure that it is an historic, inclusive and accessible event. We want prisoner and exprisoner involvement to be a feature. Let those most affected be heard and let us share their future! Northern Ireland, Palestine and the Middle East, (Post) Colonial Justice Nigeria and West Africa, South Africa: ANC, Brazil, USA, Canada. Refugee and Immigration Prisons, Prisons under Occupation. Organising Inside: Prisoners' resistance and the Outside Community, Writing and Art as Resistance, Barriers to Reintegration, Surveillance, Organising in the Community - Exprisoners' Organisations, Convict Criminology. Tasmania is an ideal place to discuss punishment. It used to be called Van Dieman's Land, and was the place where most of the original convicts were sent from England from 1788 until the 1850's. It was the ultimate as a penal colony, was almost entirely a prison, and changed its name to avoid the historic shame. It had penal settlements where convicts were tortured - all well documented. And the convict responses are very special learning experiences, still valid today. Robert Hughes book "The Fatal Shore" ISBN 0 099 45915 9 is well worth the read. SEE YOU IN VAN DIEMAN'S LAND 2006!! 1983 - ICOPA 1, the First International Conference on Prison Abolition took place in Toronto, Canada. It was organized by grassroots prison rights activists, prison abolitionist academics, ex-prisoners, Quakers and interested community members. A resolution was passed to make ICOPA a bi-annual event. 1985 - ICOPA 11 was held in Amsterdam and was organized by mainly academics and European scholars. 1987 - ICOPA III was organized by a prison abolitionist group in Montreal, Canada. This conference marked a huge change in the abolitionist movement. Participants and conference organizers decided that a goal to abolish the prison was not sufficient. The real problem was the penal mindset which allowed the prison to exist; thus, to abolish the prison without abolishing the penal mentality and penal structure would only open us up to more oppression. As a result of this realization, the International Conference on Prison Abolition transformed to become the International Conference on Penal Abolition. 1989 - ICOPA IV was held in Poland during a time of political upheaval (iron curtain had not fallen yet) and great oppression. This conference was small but very successful in its showing of bravery and true human commitment to this movement. 1991 - ICOPA V was held in Indiana, USA. This conference focused on Native/Aboriginal Justice and racism in the American Justice System. 1993 - ICOPA VI was held in Costa Rica. This is considered to be among the most successful conferences because it included many scholars, activists, ex-prisoners and government officials who were taking the movement and its ideas seriously. 1997 - ICOPA VIII was held in Auckland, New Zealand. This conference was a good opportunity to learn about Maori Justice and Alternative Justice models based on Maori traditions. 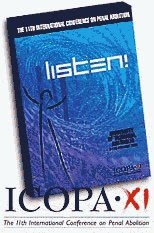 2000 - ICOPA IX was held in Toronto, Canada. Returning to the city it was born in, this conference focused on Transformative Justice and the Corporate Agenda's role in Criminal Justice. 2002 - ICOPA X in Lagos, Nigeria. It was the first one in Africa. The theme: Transformative Justice and Practical Alternative to the Penal System.. The Movement to Abolish Prisons is as old as prisons themselves. In the 19th century, voices like Thomas Buxton of the British Parliament and Victor Hugo of France condemned the prison system and retributive justice. In 1976 Gilbert Cantor, a former editor of the Philadelphia Bar magazine, wrote in that prestigious magazine: "If our entire criminal justice apparentus were simply closed down...there would probably be a decrease in the amount of behaviour now labeled 'criminal'. The time has come to abolish the game of crime and punishment, and to substitute a paradigm of resitutition and responsibility. The goal is the civilization of our treatment of offenders." Justice Action is a community-based organisation of criminal justice activists. We are prisoners, academics, victims of crime, ex-prisoners. The documentary addresses penal abolition as a concept and issues surrounding that policy. It presents the 11th International Conference on Penal Abolition held in Tasmania, Australia over the 9-11th February 2006. The NSW Department of Corrective Services (DCS) has revealed a policy which bans ex-prisoners from entering prisons. NSW: Justice Action went to the NSW Supreme Court before the last Federal election on the constitutional right for prisoners to receive information for their vote. The government avoided the hearing by bringing prisoners' mobile polling booths forward. We pursued it after the election. This is the report. Hamlet: [...] what have you, my good friends, deserved at the hands of fortune, that she sends you to prison thither? Rosencrantz: Then the world is one. Hamlet: A goodly one; in which there are many confines, wards and dungeons. US: According to the latest statistics from the U.S. Department of Justice, more than 2.3 million men and women are now behind bars in the United States. Yes, the country that touts itself as the "land of the free" and the champion of freedom around the world incarcerates a higher percentage of its people than any other country. The US penal system, the world's largest, maintained its steady growth in 2004, the US Department of Justice reported.The latest official half-yearly figures found the nation's prison and jail population at 2,131,180 in the middle of last year, an increase of 2.3 per cent over 2003. US: First of all, this is not about a simple baseball game. This is about the most important thing of all, the game of life. The Three-Strikes law (mandatory sentencing for three felony convictions) came into being through fear, manipulation and, yes, full-blown prejudice. I write as an Australian prisoners' rights campaigner who has been watching Amnesty's interventions over the arrests and jailing of several dozen "dissidents" in Cuba over the past two years. I have also visited Cuba on two occasions. Unlock the Box is a product of many years of struggle to shut down the Security Housing Units in California. During this time, the United Front to Abolish the SHU was created as a forum to coordinate the actions of everyone involved in this campaign. I went to Baxter this Easter just past, and became more aware that this time is akin to the time in Nazi Germany when the concentration camps were being set up. UK: Dirty, mice-infested cells, high levels of self-harm, and widespread bullying over drugs and medications were just some of the damning findings of a report into conditions at Holloway, Britain's largest women's prison. WA: The Prison Reform Group of WA is calling for a complete overhaul of the Department of Justice following recent events which have compromised its integrity, placing prison staff, prisoners, their families and the community, at risk. We call for the Minister to publicly apologise for last week's debacle which has seen the public badly let down by the Department of Justice yet again. Philippines: The Un-Australian: "NEGOTIATORS last night made a breakthrough in the 12-hour standoff with al-Qa'ida-linked militants?, (suspected and imprisoned people) who staged an escape attempt from a Philippines prison that left six people dead." UK: First interview with ex-detainee reveals a regime that leaves him in despair : Ex-detainee exposes flaws in terror control orders. 14,500 children in NSW go to bed each night with a parent in prison! CIA defends terror suspect transfers? Suspected terrorists [scapegoats for the Coalition of the Killings's resource wars in the Middle East] in US custody have been transferred to third countries for the past 20 years, CIA director Porter Goss told the US Senate armed services committee. The reason for this article is because a Secretary at the Council for Civil Liberties stated to me that they haven't got the funding to help me with a false imprisonment case which happened February 97 - and in February 2005, it will be 7 years after the incident which will mean I will be too late to bring a civil case to court? Women make up 6% of the prison population in England and Wales. Imprisonment of women should be "virtually abolished", a prison reform group has said. On Friday night the NSW Council for Civil Liberties awarded Sydney solicitor John Marsden honorary life membership. Julian Burnside was invited to make the speech in Marsden's honour. In the course of his speech, Burnside referred to the unregulated use of solitary confinement in Australia's immigration detention centres, criticising it as inhumane and also as unlawful. She has managed to turn life in federal prison into a nifty career move. Her company's stock is soaring, and she has plans for not one but two television shows. It almost makes you wonder why the Enron types are fighting so hard to stay out of jail. UK: An Asian teenager was murdered by a white racist after they were placed in the same cell as part of a game to fulfil the "perverted pleasure" of prison officers, a public inquiry heard on Friday. Some will remember that Bob was In the Bathurst riot in February 1974 and was a leading member of the Prisoners Action Group now - (JusticeACTION) upon his release. He wrote Stir, the screenplay upon which the film Stir was based. He played a major role in agitating for a Royal Commission into the events at Bathurst, and when the Nagle Commission commenced hearings Bob was to be found every day sitting in court for the duration, following proceedings for the PAG. The use of segregation [solitary confinement] of prisoners as punishment has been increasing recently in Australia, the US, and the UK. Segregation can be used for protection or punishment, but in both cases it results in extreme psychological stress. An indication that segregation is being over-used is the appearance of deaths in custody from suicide of those placed in segregation. When I first saw the photo, taken at the Abu Ghraib prison, of a hooded and robed figure strung with electrical wiring, I thought of the Sacramento, California, city jail. There has been much written about solitary confinement by some of the world's leading psychiatrists, but very little written by victims of solitary themselves. I believe that the 32 years I have spent in solitary qualifies me for the task. March 6 -- Protesters took to the streets in cities across the state of California to demand California prisons shut down the Security Housing Units (SHU). Like other control unit prisons across the country, the SHU are prisons within a prison. They are solitary confinement cells where prisoners are locked up 23 hours a day for years at a time. The one hour a day these prisoner sometimes get outside of their cell is spent alone in an exercise pen not much larger than their cell, with no direct sunlight. From Terrell Unit in Texas to Abu Ghraib Doesn't It Ring a (Prison) Bell If the president wasn't so forthright about his disinterest in the world, it would have been hard to believe him Wednesday when he said the abuse in Abu Ghraib prison "doesn't represent the America I know." NEW ORLEANS: The nation's highest court refused Monday to kill a lawsuit brought by two prisoners and an ex-inmate at the Louisiana State Penitentiary who spent decades in solitary confinement. Restorative Justice Practices of Native American, First Nation and Other Indigenous People of North America: Part One BY LAURA MIRSKY. We are shooting for over 2,000,000 signatures on the LERA petition! That is one signature for every person incarcerated in the United States! US Prison system ending love affair with incarceration? After 25 years of explosive growth in the U.S. prison system, is this country finally ending its love affair with incarceration? Perhaps, but as in any abusive relationship, breaking up will be hard to do. In his autobiography, Frederick Douglass recalls how as a slave he would occasionally hear of the "abolitionists." He did not know the full meaning of the word at first, but he heard it used in ways that he found appealing. He heard about it when a slave ran away or killed his master. He heard about it when a barn was set on fire or a slave committed an act his master thought wrong. For Douglass, these utterances and reports were "spoken of as the fruit of abolition." He adds, "Hearing the word in this connection very often, I set about learning what it meant." Just a reminder message about the meeting this Wednesday, if any of you are able to come down after BBA meeting. Apologies about the clash of days, definitely not intended. It seems great minds think alike! 2nd Renaissance - Beyond Industrial Capitalism and Nation States Some Practicalities Of Emptying The Prisons  Given the importance that prisons and punishment have in maintaining control of increasingly restless populations, the task of achieving the release of the people in the jails and the closure of those institutions, seems daunting. But it is so vital to the 2nd Renaissance that we must find ways to do it.